President Bush has repeatedly said in recent months that he would lead the United States in taking steps to reduce oil consumption, combat global warming and expand the production of renewable fuels. 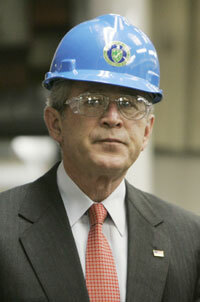 Bush signed the Energy Independence and Security Act in December, and in his State of the Union address just last week, he said that we must continue to invest in renewable fuels and that the United States is committed to strengthening our energy security and confronting global climate change. Yet a quick look at the president’s FY 2009 budget proposals for the Department of Energy and Environmental Protection Agency programs show cuts in critical areas, including climate protection, tribal energy, and solar energy, while funding for fossil and nuclear energy was increased. And some programs, such as Weatherization Assistance Grants, and the Renewable Energy Production Incentive, were zeroed out entirely. $1.26 billion: Total fiscal year 2009 budget request for Department of Energy Efficiency and Renewable Energy programs. 27 percent: Decrease in funding from the fiscal year 2008 appropriations level. $385.5 million: Increase in nuclear energy funding, which amounts to 37 percent increase from FY 08 appropriations. $222.7 million: Increase in fossil energy funding, which amounts to a 25 percent increase over FY 08 appropriations. $570 million: Proposed cut to The Low Income Home Energy Assistance Program, which assists low income households in meeting their immediate home energy needs. This is a 22 percent cut from FY 08, even before adjusting for changes in energy prices. The new energy law authorizes $5. 1 billion for this program. More than one million: Number of low-income families and elderly people that would need to be cut from the LIHEAP program to meet the new budget. 65 percent: The percentage increase in home energy prices since 2001. 0 percent: The percentage increase in this year’s LIHEAP budget since 2001. $0: Proposed budget for Weatherization Assistance Grants, which increase the energy efficiency of dwellings occupied by low-income Americans, thus directly reducing their energy costs, electricity use, and global warming emissions. This is a 100 percent cut from the $227 million allocated in fiscal year 2008. $0: Proposed budget for the Renewable Energy Production Incentive program, which provides financial incentive payments for electricity produced and sold by new qualifying renewable energy generation facilities. This is a 100 percent cut from the $5.0 million allocated in fiscal year 2008. $6.9 million: Proposed cut to the hydropower program, whose purpose is to develop, conduct, and coordinate research and development with industry and other federal agencies to improve the technical, societal, and environmental benefits of hydropower, which includes wave, tidal, and traditional dam hydropower. This is a 70 percent cut from the fiscal year 2008 appropriations level. $12.3 million: Proposed cut to the solar energy program, which works to accelerate the development of solar technologies as energy sources for the nation and the world, as well as educate the public about the value of solar power as an energy choice. This is a 7 percent cut from the fiscal year 2008 appropriations level. $26.8 million: Increase in biomass and biorefinery systems R&D. This is a 13 percent increase from FY08 appropriations and should be commended as an investment in low-carbon alternatives. $10.2 million: Increase in geothermal technology. This is a 51 percent increase from FY08 appropriations and should also be commended as an investment in low-carbon alternatives. $0: Proposed budget for the greenhouse gas reporting registry, an EPA program for voluntary reporting of greenhouse gas emissions and reductions. This is a 100 percent cut from the $3.4 million allocated in fiscal year 2008. $6.9 million: Proposed cut to the EPA Climate Science and Technology Program, which focuses on research and development of energy and sequestration technologies critical to long-term emissions reduction for coal fired power plants and other sources. This is a 38 percent cut from the fiscal year 2008 appropriations level. $10.3 million: Proposed cut overall to climate protection programs such as Energy Star, SmartWay Transport, the Methane to Markets Partnership, and the Asia-Pacific Partnership. This is a 9.5 percent cut from the fiscal year 2008 appropriations level. $4.0 million: Proposed cut to Energy STAR, a joint program of the EPA and the DOE helping consumers save money and protect the environment through energy efficient products and practices. This is an 8.3 percent cut from the fiscal year 2008 appropriations level. $4.9 million: Proposed cut to tribal activities such as the Tribal Energy Program, which provides financial and technical assistance to Native American tribes for feasibility studies of renewable energy development on tribal lands, and offers assistance to tribes for the initial steps toward renewable energy and energy efficiency development. This is an 83 percent cut from the fiscal year 2008 appropriations level. $3.2 billion: The amount the administration is proposing to transfer from the Mass Transit Account to the Highway Account. This is going in the wrong direction; funding for mass transit is a more effective way to encourage people to drive less and reduce global warming pollution from cars. The president’s budget stands in the way of progress on the urgent task of global warming reduction. It will be up to Congress to see to it that these critical programs are represented in the final budget.